Thoracic Outlet Syndrome surprisingly, is one of the more common conditions diagnosed by Dr. Jeff J. Mollins. 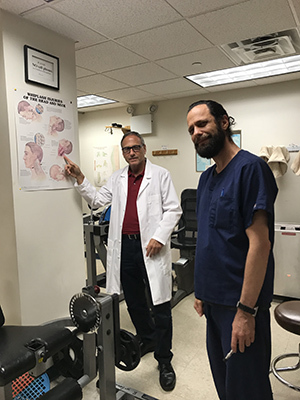 As the premier accident specialist in New York, with almost 30 years of experience, Dr. Mollins is well aware that Thoracic Outlet Syndrome can result from a traumatic accident/or repetitive motion. Thoracic Outlet Syndrome must be promptly and properly diagnosed so that the injured person can begin a comprehensive regimen of therapy to achieve wellness as expeditiously as possible. Thoracic Outlet Syndrome can range from mild to severe and the sooner it is treated, the sooner it can be resolved and prevent this condition from becoming dire. Thoracic Outlet Syndrome is a group of disorders that occur when blood vessels or nerves in the space between your collarbone and your first rib (thoracic outlet) are compressed. This can cause pain in your shoulders and neck and numbness in your fingers. Common causes of Thoracic Outlet Syndrome include physical trauma from an accident (work, automobile, slip and fall, construction accident etc), or repetitive injuries from a job (such as working on a computer), or sports related activities. If you consistently experience any of the signs and symptoms of Thoracic Outlet Syndrome – see Dr. Mollins immediately. Dr. Mollins, as always, will conduct a careful history and then perform a comprehensive physical examination to determine an accurate diagnosis. Diagnostic testing and/or radiologic testing may be necessary. If a diagnosis of Thoracic Outlet Syndrome is determined, then Dr. Mollins will recommend a proper therapeutic regimen. Remember, if the cause of the Thoracic Outlet Syndrome is due to a work related accident whether traumatic (like a slip and fall) or due to repetitive motion (i.e. working on a computer), then it will be covered under workers compensation. Dr. Mollins (and all of his referred medical specialist) are certified to treat workers compensation patients, so you will be treated at no cost.